Pack struggles can be minor or major as dogs jostle for position within the family pack. One visitor's dogs don't seem able to work it out on their own. Share her story. This is a complicated situation. I have a four-year-old spayed female Golden Retriever that I have had since she was eight weeks old. Four months ago, I adopted a two-year old neutered male Newfoundland. Since that time, the Golden has become food aggressive, biting both my husband and myself for table scraps or her bowl. She has also attacked other dogs for food. Now, we are with my mother at our lake house for the summer. She has a five-year-old neutered male Briard/Bearded Collie that was rescued three years ago. He has dominance issues and "herds" the pack. That is the background. Here is the issue. Since getting to the lake house, the two male dogs have been struggling for dominance. The Briard growls and bites the Newf. He tolerates it for so long, and then bites the Briard. The Newf shows his dominance by staring the Briard down and holding his head over the Briard's head. While the two male dogs are figuring it out, the Golden gets into the mix and bites the other dogs viciously. She has drawn blood on both males. Screaming and spraying water doesn't stop her. She goes on until either my mom or I grab her by the neck and pull her off. Still, she is pumped for the fight for another three to four minutes. Once she is out of the mix, the males settle themselves down. How do we stop this from happening? It has happened once a day for the past three days. I'm not going to kid you Kim, I am very concerned about the fact that your Golden is drawing blood on the other dogs and biting you and your husband. She is completely out of control, and her issues will require a lot of one-on-one work. You and your husband have to establish your dominance over her first before you can work on her issues with the other dogs. The reason I say "establish" instead of "re-establish" dominance is because I suspect that she may have already been in charge before you brought the Newf home. There just wasn't much conflict because she had no competition. She obviously isn't looking to you as her leaders while trying to adapt to the new pack make up, and I'm wondering how you handled introducing the new dog into your household. She's taking command of the situation herself, and the results are getting dangerous. She is clearly confused at this point and desperately needs and deserves your help. What you truly need at this point is a canine behaviorist who can come to your home, observe the situation and teach you how to retrain your dog. This is not something that can be solved long distance. Now for the boys. It sounds from your description as though the Briard is the one that tends to start the tussles with the Newfoundland, but that they are not actually injuring each other, and seem to knock it off once the Golden is out of the picture. The Briard mix's heritage is strong on herding dogs, so you won't be able to eliminate that instinct. These dogs only need to get along for a short time. Both you and your mother must firmly take charge of your respective dogs so they know that you are their leaders and you do not approve of the fighting. I think their situation is far more easy to work out. 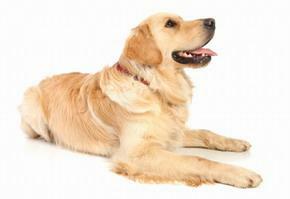 I believe for the safety of all concerned, you need to keep the Golden away from the other dogs for the time being until you begin to get a handle on her behavior. You could try searching for a boarding facility that would be willing to kennel her separately from other dogs for the rest of your vacation, but that will be difficult since most facilities will require your dog to pass a temperament test. At this point I'm not confident that she could. Please let me know what you work out for your Golden. I'd like to keep in touch on this one.